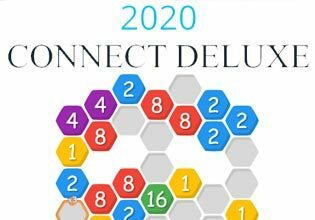 2020 Connect Deluxe, the most addictive logic puzzle game is back in a definitive edition that is even more fun! The player's task is to place at least four blocks with the same number on it next to each other so they get merged. 2020 Connect Deluxe takes the best ideas of games like Merged and 2048 and turns it into a total blast. Merging more than four blocks will reward you with coins that later can be spend to purchase cool boosters. Take your time, plan ahead and think for a long as you need to, there is no hurry. Play 2020 Connect Deluxe now for free! How far can you make it? Will you be able to get the legendary 8192 blocks to merge?